Starbucks is a great place for a pick me up. People stop there and grab something to keep them awake. If Starbucks had just stuck to Coffee, Snack Girl readers would be safe to enter the store and grab a 2 calorie beverage of roasted bean juice. But, alas, there are This Muffin Has a Dark Secrets, scones, cookies, and white chocolate mochas. Yikes. What to do? Well, a company called Peeled Snacks has come to our rescue. The snacks are 120-150 calories of dried fruit in brightly colored plastic bags. I have not only seen them at Starbucks but also in airports around the country. They taste absolutely delicious because Peeled Snacks is not your average dried fruit purveyor. We keep our snacks as close to natural as possible by using high quality ingredients. When you bite into a juicy piece of fruit or a crunchy nut, you'll wonder why anyone would want to add sugar or fat. There is a lot of sugar in dried fruit, but you will also get the good stuff of fiber, protein, and vitamins. These are a great way to have a treat without a mega calorie cost. 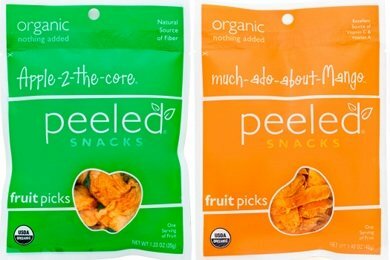 The cool people at Peeled Snacks would like to give a Snack Girl reader an Organic Fruit Picks Variety Pack. To enter check out the Peeled Snacks website and pick a fruit that sounds good to you. Post your choice in the comment box below and you are entered! Comment below on your favorite dried fruit flavor. Comment on our wall about about your favorite dried fruit flavor. Tweet this post (use the Tweet Button in the Share Box at the top of this post). Snack-Girl can follow and count all the additional entries using magical website tools. When do I find out if I am the winner? Oh wow - these look great! I love bananas and cherries, so it's a tie between Cherry-Go-Round and Banan-a-peel. Cherry-Go-Round! I wonder if it would satisfy my craving for cherry pie? I'd have to say pine-4-pineapple would be the one i'd pick. Then again the mango is a very close second! I would want to try the fig fruit snack for sure! I grew up in an apple orchard and apples have always been my favorite treat. So that is my first choice. But I have a second and third and fourth......they all sound fantastic!